Being faced with a life-threatening medical situation with a stranger is one thing. It is entirely different when the person facing the medical situation is a relative – and even more challenging when the patient is a parent. While sitting at a restaurant with his family, Sid Gaudry (a patroller) suddenly felt hot and nauseous. These same symptoms had been experienced five months earlier during an unexplained seizure. Clearing the area and helping Sid lie down were his daughters Nichole Diewold and Jacqueline McIlmoyl, both patrollers. Within seconds, Sid became unresponsive and started seizing. EMS was called and Nichole left to find an AED. Jacqueline could not detect a radial or carotid pulse, nor could two physicians who ran from a neighbouring medical clinic. Jacqueline began compressions while her mother Caroline, (a retired patroller) began respirations. Pulse and respirations did return, and Sid was transported to hospital, where a brain tumour was later diagnosed. Follow-up treatment included surgery, chemotherapy and radiation. Making this event even more challenging was the presence of six grandchildren, all under the age of six who had to be removed from the scene,. Additionally, it took more than 10 minutes to locate an AED. Jacqueline was able to use her skills and training as a patroller to take charge of the situation, perform the necessary lifesaving skills, and save the life of her father. What makes this event even more amazing is that in recent years, Sid Gaudry and his daughter Nichole have each been recognized with lifesaving awards, both of which required CPR interventions. We applaud the actions of Jacqueline, commend her quick actions. 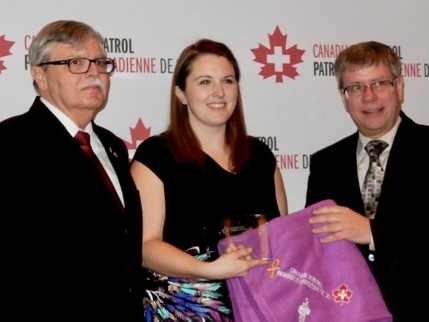 The CSP was proud to present her with the John D. Harper Lifesaving Award in Quebec City this past March, 2018.